At the beginning of June, TDG reviewed May performances for infielders, outfielders, and pitchers. In addition, TDG updated the Top 240 Fantasy Prospects, including 2018 MLB draftees. Since early June, several notable prospects exceeded rookie limits and others arrived in the majors. In addition, June saw the start of short season leagues! As this update only reviews performances for one month, please note this bright, flashing warning: SMALL SAMPLE SIZE! Joey Lucchesi, San Diego Padres. Last week, Lucchesi returned from the disabled list and did not get out of the second inning. In his next start, he threw four shutout innings. Expect the Padres to deploy Lucchesi cautiously as he recovers from a hip strain. An unorthodox pitcher, Lucchesi employs deception and an odd, but effective, “churve” to find success. Fernando Romero, Minnesota Twins. Immediately after Romero exceeded rookie limits (51 1/3 IP), the Twins optioned him to Triple-A. Chiefly a two-pitch pitcher, he relies on a mid-90s fastball and a hard, upper-80s slider. In addition, Romero mixes in a below-average, firm, low-90s change-up. With two above-average to plus pitches and shaky command, he has a relief profile, but he could be a solid, but inconsistent, starter. Jaime Barria, Los Angeles Angels. Despite a below-average fastball, Barria has been successful with two excellent offspeed pitches (slider and change-up) and above-average command. Ultimately, he profiles as a backend starter as major league hitters obliterate his fastball (.554 SLG). Shane Bieber, Cleveland Indians. In his return trip to the majors, Bieber has impressed, allowing just 2 earned runs over 18 2/3 innings. Showcasing his patented elite command, Bieber has issued just 4 walks (3.9%). In addition, his slider has elicited 42.6% whiffs over his last three starts. Jonathan Loaisiga, New York Yankees. Despite a small 5’11” and 165-pound frame, Loaisiga is a power pitcher. With a fastball averaging 95.8 mph and a swing-and-miss mid-80s curveball, he is off to a strong start. Further, Loaisiga sports an improved, fading change-up, which now profiles as at least average. If the plus control he demonstrated in the minors (2.2 BB%) translates to the majors, watch out! 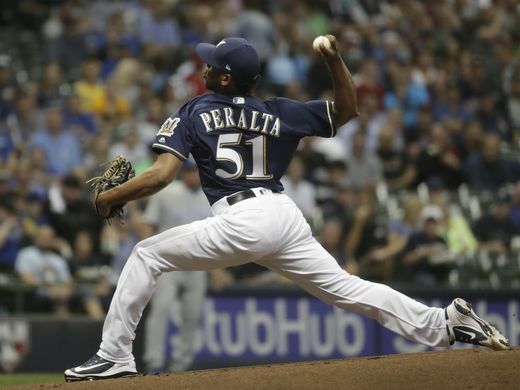 Freddy Peralta, Milwaukee Brewers. Arguably, no pitching prospect has been better than Peralta in June. Between Triple-A Colorado Springs, a hitter’s haven, and the majors, he has allowed just 2 earned runs, 11 hits, and 5 walks in 28 1/3 innings, while striking out 42 batters. Interestingly, Peralta overwhelmingly relies on his low-90s fastball (80.5%), which confounds hitters (.088 BAA!). Although he is on a roll, he is small (5’11”), has a wild delivery, and has a track record of poor command. Everything in his profile screams reliever. Seranthony Dominguez, Philadelphia Phillies. Speaking of relievers, Dominguez is currently the closer for the Phillies, and excelling. 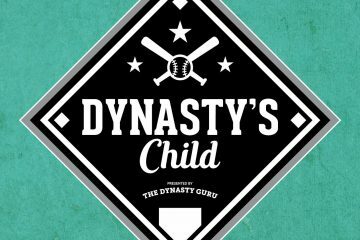 With a huge, 98 mph fastball, plus slider, and improved command, he is becoming one of the top dynasty relievers. Eli Morgan, Cleveland Indians. An eighth round pick in the 2017 draft, Morgan is yet another in a recent trend of command over stuff arms for the Indians. Relying on a double-plus change-up, he carved up hitters in High-A in June (2.22/0.74 ERA/WHIP, 28 1/3 IP, 32/7). Entering the season, Morgan hoped to replicate the success of Shane Bieber, and, thus far, he is doing a great job limiting walks (5.2%). Cristian Javier, Houston Astros. One of the most dominant pitchers in the minor all year, Javier received a promotion to High-A earlier this month. Since his promotion, he has allowed just 1 earned run and 7 hits over his first 18 innings. On the year, Javier has 94 strikeouts in just 67 1/3 innings (36.2%). Despite a mediocre, low-90s fastball, he has found success with a devastating slider and improved change-up. Luis Patino, San Diego Padres. One of many in a loaded 2016 international signing class for the Padres, Patino is turning heads in Low-A. Only 18 years old, he already throws gas, sitting in the mid-90s and touching 97 mph. In addition to the fastball, Patino throws three offspeed pitches, headlined by a potentially plus, 12-to-6 curveball. Over the past month, he has been excellent (1.59/1.12 ERA/WHIP, 17 IP, 24/4 K/BB). Mitch Keller, Pittsburgh Pirates. This past month, Keller has been nearly unhittable, allowing just 11 hits in 26 innings pitched (0.69/0.81 ERA/WHIP). Despite his excellent performance, he continues to see a reduced strikeout-to-walk ratio (12.9 K-BB% in 2018 versus 18.1 K-BB% in 2017). On Wednesday, the Pirates promoted Keller to Triple-A. Hunter Greene, Cincinnati Reds. Since his rough first five starts of the season (13.97/3.21 ERA/WHIP), Greene has been electric. Over his last nine outings, he has a sparkling 49-to-9 strikeout-to-walk ratio in 43 2/3 innings (2.68/1.05 ERA/WHIP). This past month, Greene has been even better, with a 31-to-5 strikeout-to-walk ratio in 27 innings. This week, Eric Logenhagen noted much improved breaking balls for Greene. Jesus Luzardo, Oakland Athletics. With three straight scoreless outings, Luzardo is back on track after a mediocre May. In June, he allowed just 1 earned run, 11 hits, and 3 walks over 20 innings (0.45/0.70 ERA/WHIP). Dakota Hudson, St. Louis Cardinals. With a sturdy 6’5″ frame, Hudson is a potential workhorse, ground ball (56.4%) pitcher. Over his last ten starts, he is averaging 6 2/3 innings pitched per start. Meanwhile, in June, Hudson is averaging nearly 7 innings per start (1.06/1.15 ERA/WHIP, 34 IP, 23/11 K/BB), with two 8-inning gems. Peter Lambert, Colorado Rockies. A second round pick in the 2015 draft, Lambert is a rare, intriguing Rockies pitching prospect. This past month, he dominated Double-A, averaging over 7 2/3 innings pitched per start (1.16/0.70 ERA/WHIP, 38 2/3 IP, 32/3 K/BB). Notably, Lambert walked just 3 batters all month, and just 12 on the year (3.4%). A polished arm, he effectively and efficiently command three average or better pitches. Michael Kopech, Chicago White Sox. Prior to his last outing, Kopech had allowed at least 4 walks in each of his starts this month. In fact, he walked 8 batters over just 3 innings on June 14th. Command and control is an ongoing concern for Kopech and his June performance (23 walks in 22 innings) raises a lot of questions. In just 73 1/3 innings pitched, he has 48 walks (14.7%), 9 hit batters, and 9 wild pitches. Stephen Gonsalves, Minnesota Twins. Like Kopech, Gonsalves is struggling with command, issuing 3 or more walks in each of his last 8 starts. During that span, he allowed 31 total walks in 33 innings. Bryse Wilson, Atlanta Braves. Since his promotion to Double-A in early May, Wilson has had little success (6.25/1.70 ERA/WHIP). Over his last six starts, he lasted past the third inning in just two starts. During that span, Wilson allowed 37 hits and 11 walks in just 23 innings. Tyler Beede, San Francisco Giants. On April 5th, Beede threw a five-inning, one-hit gem in Triple-A, immediately earning a promotion to the majors. Since then, his command (and his season) has steadily gone downhill, ultimately leading to a recent transition to the bullpen. For the season, including his brief cup of coffee, Beede has issued 57 walks in just 68 1/3 innings. Top pitching prospect Forrest Whitley returned from a 50-game suspension earlier this month. Other than a hiccup in his last start, he has dominated. Sixto Sanchez has been on the disabled list since early June with right elbow inflammation. Mike Soroka (right shoulder inflammation) and Dennis Santana (right rotator cuff strain) are on the 60-day disabled list and out until August. First overall pick Casey Mize received a record $7.5 million signing bonus under the current bonus pool rules. Triston McKenzie, Franklin Perez, and Alec Hansen returned from injury earlier this month. The Brewers moved Corbin Burnes to the bullpen, likely with the intent to promote him to the majors in a relief role later this summer. Jon Duplantier has not pitched in June due to right biceps tendonitis. Alex Faedo and Dylan Cease received promotions to Double-A. Pablo Lopez received a promotion to Triple-A. The White Sox shutdown Dane Dunning for the next 6-8 weeks after he suffered a moderate right elbow sprain. Adbert Alzolay is out for the season with a Grade 1 right lat strain. Hunter Harvey has missed most of the month due to posterior shoulder instability. So far, so good with the rehab of Yadier Alvarez in the Arizona League (7 IP, ER, 10 K, 5 H, BB). The Mets promoted Justin Dunn to Double-A. Ryan Helsley is on the disabled list with shoulder fatigue. Seth Romero finally debuted for Low-A Hagerstown this month after a long exile for repeatedly breaking team rules during spring training. A first round pick in the 2017 draft, Clarke Schmidt finally made his professional debut following Tommy John surgery.